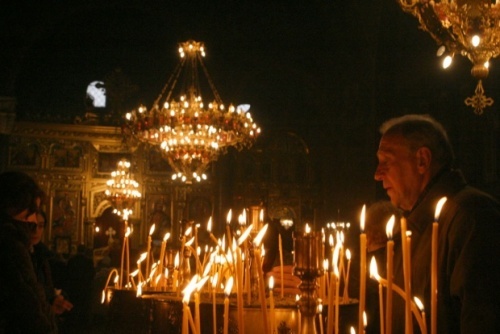 Bulgaria marks Sunday the Day of Tsar Boris I known as The Baptist with solemn masses in churches around the country. Boris I converted to Christianity along with his family in 864. According to most historians, Boris was secretly baptized at Pliska by an embassy of Byzantine clergymen, together with his family and select members of the Bulgarian nobility. With Emperor Michael III as his godfather, Boris also adopted the Christian name Michael. Some historians attribute Boris’ religious conversion to the intervention of his sister who had already converted while being at Constantinople while another stories mention a Greek slave in the ruler's court or Boris’ astonishment and fright by an icon of Judgment Day prompting him to adopt Christianity. In 865 all Bulgaria converted to Christianity, but the conversion met great opposition in Bulgaria. In the summer of 865 a group of aristocrats (boyars) started an open revolt. Boris ruthlessly suppressed, executed 52 boyars together with their entire families and the Christianization continued. In 886 Boris' governor of Belgrade welcomed the disciples of Saint Cyril and Saint Methodius, who were exiled from Great Moravia into Bulgaria and sent them on to Boris in Pliska. Two of these disciples, Clement of Ohrid and Naum of Preslav who were of noble Bulgarian origin, set up educational centers in Pliska and in Ohrid to further the development of Slavonic letters and liturgy. The alphabet that was originally developed by Cyril and Methodius is known as the Glagolitic alphabet. In Bulgaria Clement of Ohrid and Naum of Preslav compiled a new alphabet which was called Cyrillic and was declared the official alphabet. The Slavic language was also declared official in 893. The introduction of Slavic liturgy paralleled Boris' continued development of churches and monasteries throughout his rule. In 889 Boris abdicated the throne and became a monk. His son and successor Vladimir attempted a pagan reaction, which brought Boris out of retirement in 893. Vladimir was defeated and blinded, and Boris placed on the throne his third son, Simeon I of Bulgaria, known to have been a devoted Christian. Boris returned to his monastery, resumed monastic life and died in 907. The location of his retreat is not certain; it may be near Preslav but also in Pliska or in a monastery near Varna or Ravda. Bulgarians named Boris, Borislav for men and Borislava, and Boryana for women celebrate Sunday their name day.